Someone asked recently how many times I had “crossed the pond” to Europe. I really don’t know. Certainly dozens of times. It’s been several times a year for as long as I remember. That makes me an extremely unusual American. Most of us never visit Europe, except maybe for a rare dream vacation. And that’s okay because our own country is wonderful and has a lifetime of sights to see. But it does affect our perspective on the world. Many of us don’t fully grasp how important Europe is to the US and global economy. We may soon get a lesson on that. I’ve talked about Italy’s ongoing debt crisis, which is not improving, but Europe has other problems, too. Worse, events are coalescing such that several potential crises—all major on their own—could strike at the same time, and not too long from now. As I’ve been saying for about three years, there is no reason for the US to have a recession on its own. I think events elsewhere will push us into it, and Europe is a really big current risk. I know from my visits to Europe and discussions with friends there, they see all sorts of problems with Trump and particularly his tariffs. However, another concern is that the various actors in Europe are not playing nice with each other. I tell my European friends the same forces that yielded Trump are coming to a European country near them. In some places, they already have. So, in my never-ending quest to keep you ahead of the curve, I’ll review what’s happening “over there.” This may be a turnabout for European readers who rely on me to describe what’s happening over here. But as you’ll see, we are far more connected than separated by distance. Now, I am not one who falls prey to click-bait headlines (nor is Jim) and I’m also well aware Europe’s economy is weakening. I would not have said recession was imminent but reading this article left me more than a little concerned. The author, economist Victor Hill, ties events together in ways many haven’t considered. Across Europe, and particularly in the 18-member Eurozone, the economic news is sobering. It’s now clear that the credit crunch in emerging markets which has played out over most of this year, plus the slowdown in China, are having negative consequences in Europe. Yet, despite the ongoing trauma of Brexit, the UK is cruising along relatively smoothly—for now. 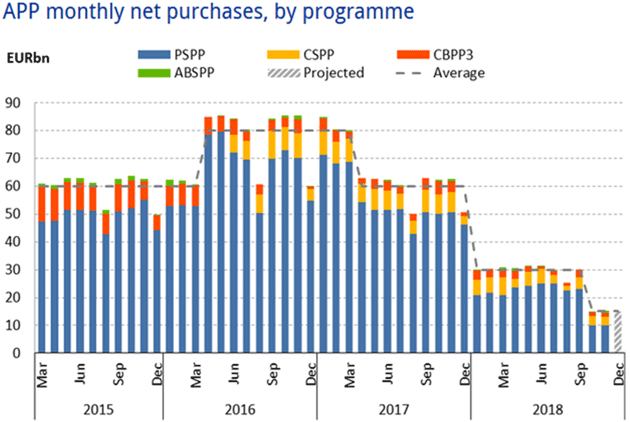 The first such event is the impending end of the European Central Bank’s quantitative easing “Asset Purchasing Programme,” which has been propping up asset prices with wholesale purchases of bonds, stocks, and anything else that isn’t nailed down. Mario Draghi and his crew borrowed our Federal Reserve’s plan and, if possible, made it even crazier. You can see in the chart they have been stepping down purchases. The pace should reach zero in early 2019. But this doesn’t account for assorted other loan programs, which some would like to see continue or even expand. Germany opposes all such policies and I think will get its way, especially since Draghi will be leaving next year. 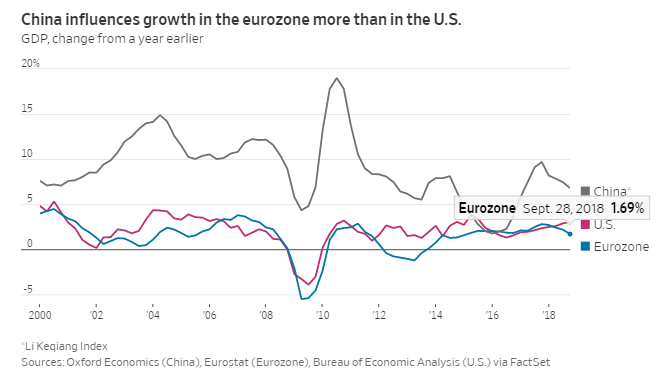 This means the Eurozone is about to lose a monetary drug on which it has grown highly dependent. But those 18 nations will not be the only ones affected. The larger EU needs a thriving core to stimulate growth for the whole continent. Note that Draghi will finish his term as ECB president in October 2019. Economists (what do they know?) project he will make his first interest rate increase just one month before he leaves, in September. That means taking rates from -0.40 bps to -0.20, still below zero. In all likelihood, his replacement will have to be approved by Germany. What will be the new president’s appetite for negative rates even in the face of recession? Will he listen to the Bundesbank? Will the ECB once again expand its balance sheet? What is left to buy? All good questions with no answers yet but potential market dangers. And if Europe falls into recession earlier in 2019, will Draghi reverse himself and resume expanding the balance sheet, buying yet more assets that are not nailed down? The Italians would certainly like that. Hill’s second “critical event” is Brexit, the latest plan for which is set for a December 11 vote in the UK’s Parliament. As of now its prospects look dim, at least without changes that the EU side says it won’t accept. That may not be true because, as we have learned, European officials are masters at vowing inflexibility and then bending when forced. But let’s have some sympathy for Prime Minister Theresa May. She is dealing with a rebellion in her own party, has lost numerous votes and it is not clear she can force her (let’s call it) Brexit-lite proposal through Parliament. You can read about her troubles here. This deal has monster implications for economics and investments and you really need to pay attention. I think I would vote against, not that anyone in Great Britain will care, as it seems to me that her compromise leaves Europe with more control over what a “final” agreement would look like. It’s not exactly what the “leave” crowd originally wanted. But in reality there are no good choices. If this is voted down, I see real chances for problems everywhere. On the other hand, remaining in the EU would enrage the millions who voted to leave and probably bring down the May government. Where it would go from there is anyone’s guess. It is hard to even imagine “democratic socialist” Jeremy Corbin as Prime Minister. So both economies are probably in for a shock unless some miracle produces orderly separation terms in the next three months, which seems unlikely. The third critical event, says Hill, is the growing Italian crisis, which I’ve been warning about for quite some time. That kettle is getting ready to boil over. Now banks in Italy are having trouble refinancing their bond issues, which is forcing them to curtail lending to an already-weak private sector. Rising mortgage rates are cutting into consumer spending. Italy is arguably already in recession but the situation looks likely to get worse—which is a big problem for its creditors, mainly Germany, which we will discuss in a bit. But Hill says, I think correctly, that the Italian crisis is no longer just economic, if it ever “just” was. It is emblematic of a culture war that is pitting anti-immigration populist movements against “elites” they believe are hostile to their interests. As happened elsewhere, unemployed and working-class people are losing faith in the system. We see this most recently in the violent gas-tax protests in France. This protest movement has an altogether different feel when you pay close attention. It is not just about higher fuel taxes. It is about almost half the country being angry at the educated city-dwelling elite while the brunt of increased taxes falls on an increasingly burdened rural middle class. 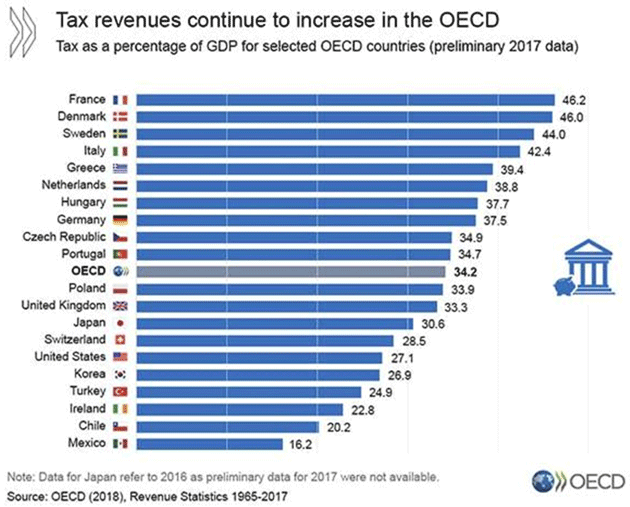 The French government now consumes 46.2% of GDP, making it the most-taxed OECD nation. Even a slight tax increase affects the working class disproportionately. And when it increases taxes on something like diesel fuel, which is critical in rural areas, it is particularly hard. In Europe and around the world, we see this pushback against what is seen as an elite group at the top (the “Protected”) which pays no attention to the problems of their less successful “Unprotected” brethren. And those brethren are demanding attention. This “morality play” is spreading through Europe. We now see German political patriarch Wolfgang Schauble backing a candidate to replace Merkel as head of the CDU (Christian Democratic Union), who is openly courting the same voters that have left their party and gone to the anti-immigration and populist Alternative for Germany (AfD). That means a conservative push for Germany and a more populist approach for mainstream parties. The common thread running through these events is the idea of a united Europe. This idea was a driving force in the foundation of the European Union and is common in the establishment and/or “elite.” Up until a few years ago, the idea was popular across the political spectrum but support has weakened as economic times changed. It was never particularly feasible, but the effort made sense for a continent so damaged by centuries of repeated wars. The problem is that the EU can’t achieve its goals unless it gets stronger and much of the public has had its fill of centralization. I don’t know how they can solve this. Brexit, if it happens, may turn out to have been the test case for a full dissolution. How that will unfold is hard to predict. For now, there are more immediate problems. Victor Hill thinks “a disorderly Brexit will be the spark that sets the Eurozone tinderbox aflame in the first half of 2019.” The tinderbox is already full in Italy and France. It won’t take much heat for that kettle to boil over. Speaking of unity, last weekend’s Buenos Aires G20 summit was a chance for world leaders to forge common ground on important global issues. That’s not exactly what happened but President Trump’s trade discussion with Chinese president Xi Jinping looked initially like a bright spot. They agreed to stop making things worse for a few months, at least. Markets were more skeptical after digesting the news—rightly so, at least from my standpoint. As I’ve said, there are real issues with China on intellectual property and more. It is not unreasonable to ask for an open and fair playing field. China is no longer an emerging market nation. It has emerged, at least the eastern half. Beijing should play by the same rules as the rest of the developed world. But getting agreement with China is going to be a hard slog. One encouraging but little-reported G20 event: US Secretary of State Mike Pompeo and Treasury Secretary Steven Mnuchin gathered their peers from the smaller G7 group for an unscheduled dinner. According to Ian Bremmer, they made significant progress on working together to solve the China issues. This should be positive if it continues. Meanwhile, however, Louis Gave explains why problems with China may be bad news for Europe at a time when Europe doesn’t need any more challenges (bold is mine). It is no secret that Trump is surrounded by men who want to “take China down,” who have argued at length that China is a house of cards built on unsustainable credit, and that all the US needs to do is give a gentle nudge for the whole edifice to come crashing down. So far, this talk of China’s vulnerability has proved way off-target. For all of the dire predictions of an imminent debt crisis and financial meltdown, China is still standing very much upright. So, if Trump wants a win, where should he look? If a long cold war of attrition with China doesn’t look promising, perhaps bashing Europe—specifically Europe’s auto industry and lack of defense spending—could prove more attractive, especially as Europe is now politically rudderless and economically slowing. My bet would be that in the coming weeks, Trump stops speaking about China, and instead starts bashing Europe. And doubtless his favorite targets will be France and Germany, perhaps as payback for the slights he endured at last month’s commemoration of the World War I armistice. If nothing else, Trump has shown that he is a firm believer in the old adage that revenge is a dish best served cold. I pay attention when Louis speaks. He often sees events that happen “around the curve.” His premise is simple: The automotive industry drives the German economy. Germany, in turn, drives the European economy. So if Trump decides to follow through on the car tariffs he’s threatened, it could be a serious blow. German auto executives met with him in Washington this week but the threat is still alive. Oh, and one more thing. Deutsche Bank, Germany’s financial crown jewel, seems to be in deep trouble. Its shares, which never recovered from the 2007–2008 ugliness, dropped to all-time lows this week after German police raided the bank’s offices in a money-laundering probe. We don’t know exactly what the fire is but there sure is a lot of smoke. Other European banks are not exactly thriving but DB seems to be in particular trouble. It is hard for us in the US to realize how important European banks are. European businesses, particularly small ones, get almost all their financing from banks. When Italian banks have trouble funding their bonds, that means Italian businesses will suffer. So add all this up. We could see Europe faced with monetary tightening, hard Brexit, an Italian breakdown, popular unrest not just in France but all over, a trade war and a German/Italian bank crisis all at the same time. Again, this is not a far-off possibility. It could all be happening in the next three or four months. If some combination of these crises develops into a perfect storm, the pain won’t stay in Europe. US, Canadian, Latin American, and Asian companies that do business with Europe will lose sales and have to lay off workers. Lenders everywhere who own Euro debt will face losses. Highly leveraged derivatives could blow up, forcing bailouts and currency interventions. We don’t know where it would lead but certainly nowhere good. The markets have been quite volatile for the past few weeks. My preferred ETF trading strategy, called Mauldin Smart Core, has performed well in this environment. Full disclosure, I have recently closed my own personal investment advisory firm down and moved my registration to my longtime friend Steve Blumenthal of CMG. As a personal business strategy, he has all the infrastructure and team to support me, and it really does allow me to spend more time researching and reading and writing. I am co-portfolio manager for the Mauldin Smart Core strategies which is available as a mutual fund or managed accounts. We have done a report called “Investing During the Great Reset,” which explains our strategy and rationale. If nothing else, it will show you how I want to deal with the risk of a coming potential bear market and give you ideas for doing it yourself or in your own firm. Of course, I hope that some of you will become clients. But I am perfectly willing to help you whether you do or not. I want as many people as possible to get from where we are today to the other side of The Great Reset. As you read this letter, Shane and I will be in Puerto Rico. Then we go to Cleveland in the middle of the month to visit with my doctor, Mike Roizen and go through the Cleveland Clinic’s Wellness Program for a few days for checkups and in my case, perhaps a few tune-ups. Then in early January (8–9) Pat Cox and I are tentatively scheduled to go to San Francisco to attend a Biotech Showcase and then a program sponsored by Jim Mellon at Juvenescence. We will talk with a number of emerging biotech companies, especially those focused on anti-aging. It will be a fascinating two days. The home team at Mauldin Economics, especially Shannon Staton and I, are focused on the 2019 Strategic Investment Conference. It is coming together nicely and promises to be our best conference ever. You want to save the dates of May 13–16 to come to Dallas at the Omni Hotel. Be prepared to have your mind expanded. It will be one powerhouse presentation after another. Since the beginning, my focus has always been to have speakers I would want to hear for myself. I’m as much an attendee as anyone else. You can’t get it all absorbed in just one sitting, which is why I spend weeks afterward reviewing the audio and video. SIC really has become the most important macroeconomic conference of the year, anywhere. When you see who is speaking, you’ll want to be there. And with that, I will hit the send button. On a personal note, I have never been as busy with more to-do items on my list as right now. I’m looking forward to tackling that list and perhaps having a little time to reflect over the holidays. Have a great week and break up your routine. Do something or see something new! It will help keep you young. Presidents Xi Jinping and Donald Trump reached an agreement at the G20 meeting in Argentina at the weekend on a framework for trade dialogue that will delay the previously announced imposition of new American tariffs on January 1. While surely better than the alternative, this step does not address any of the fundamental tensions in the economic relationship between US and China. Few observers doubt that China needs to make significant changes in areas such as intellectual property, rights of foreign investors and subsidies to state-owned companies if it is to meet international norms. Antipathy towards Chinese economic practices is hardly confined to Mr Trump. Recent months have witnessed attacks on the existing economic relationship from officials of previous US administrations, noted China experts and the American businesses. It is fair to say there are no “panda huggers” left in Washington. When foreign governments get past their frustrations with Mr Trump, they too are frustrated with Chinese commercial practices. Yet it is easy to sympathise with Chinese leaders who insist that China’s political system is for it to choose, and that economic negotiations should focus on the pragmatic identification of win-win opportunities, rather than on questions of ideology. But, at the same time, it is hard to see how anyone with a modicum of historical knowledge could fail to be concerned by a combination of increased domestic repression, the centralisation of power in one man, rapidly increased military spending and rhetoric about enlarging China’s role in the world. What the US requires is a viable strategy for addressing its legitimate grievances. Unfortunately neither rage nor proclamation constitutes such a strategy. A workable approach would involve feasible objectives clearly conveyed and supported by carrots and sticks, along with a willingness to define and accept success. At the heart of the US’s problem in defining an economic strategy towards China is the following awkward fact. Suppose China had been fully compliant with every trade and investment rule and had been as open to the world as the most open countries at its income level. China might have grown faster because it reformed more rapidly or it might have grown more slowly because of reduced subsidies or more foreign competition. But it is highly unlikely that its growth rate would have been altered by as much as 1 percentage point. Equally, while some US companies might earn more profits operating in China and some job displacement in American manufacturing due to Chinese state subsidies may have occurred, it cannot be argued seriously that unfair Chinese trade practices have affected US growth by even 0.1 per cent a year. This is not to say that China is not a threat to the existing international order. And for the US to lose its position as the world’s largest economy, after a century of dominance, would be a seismic event. If, as is plausible though not certain, the US loses its lead over the next decade in information technology, artificial intelligence and biotech, the trauma will be magnified. Can the US imagine a global system in 2050 in which its economy is half the size of the world’s largest? Even if we can imagine it, could a political leader acknowledge that reality in a way that permits negotiation over what such a world would look like? While it might be unacceptable to the US to be surpassed in economic scale, does it have the means to stop it? Can the US hold China down without inviting conflict? These are very hard questions without obvious answers. But that is no excuse for ignoring them to focus only on short-run frustrations. China appears to be willing to accommodate the US on a specific trade issue as long as the US accepts its right to flourish and grow, knowing that sheer weight of numbers will make it the world’s largest economy before long. That is a deal the US should take while it can. It can bluster but cannot, in a globalised economy, hold China down. Trying to do so risks strengthening the most anti-American elements in Beijing. Mr Trump, for all his failings, has China’s attention on economic issues in a way that eluded his predecessors. The question is whether he will be able to use his leverage to accomplish something important. That will depend on his ability to convince the Chinese that the US is capable of taking yes for an answer, and on his willingness to go beyond small-bore commercialism. We can hope but should not hold our breath. The weekend truce in the Sino-American trade war comes as a relief for Europe. Yet it is Beijing’s reluctance to stimulate growth, not trade tensions, that poses the bigger threat to the continent’s economy. On Saturday the U.S. agreed to hold off on a planned increase in tariffs on Chinese goods, scheduled for Jan 1., in exchange for China buying U.S. farm and energy products. Late Sunday President Donald Trump tweeted that China had also agreed to “reduce or remove” tariffs on cars shipped from the U.S. to Chin. Stock markets around the world rose on the news, but optimism was especially high in Europe. Among the top risers were sectors that have suffered this year because of exposure to China, particularly in the export-heavy German DAX. Car makers like BMWand Daimler ,both of which have major factories in the U.S., were up more tshan 5%. European chip makers and luxury stocks also benefited. Germany’s car makers aside, though, Europe’s China problem is mostly unrelated to tariffs or trade barriers. If anything, Chinese growth has come too easy to corporate Europe. 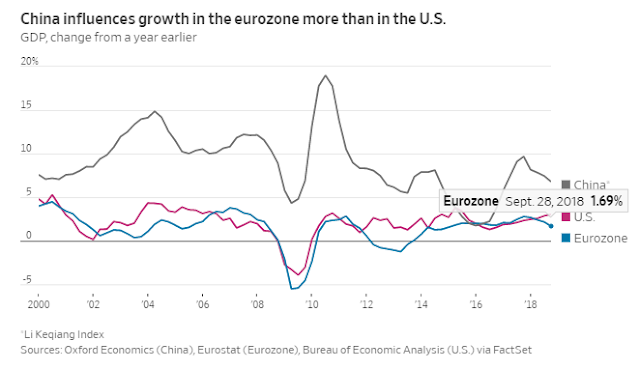 As eurozone wages stagnated and governments engaged in austerity programs over the past decade, European growth became increasingly dependent on exports. Industrial production in Germany, Europe’s main economic engine, reliably lags Chinese growth. The Asian powerhouse is, therefore, more important to Europe than it is to the U.S., and big European stocks have become plays on the country. Regardless of what happens with tariffs, this is now looking a risky bet. Chinese official economic data tends to be unreliable, but the so-called Li Keqiang Index—an indicator named after the Chinese Premier, which looks at credit, railway cargo volumes and electricity consumption—has been declining since the third quarter of 2017, before any tariffs were imposed. Not coincidentally, economic growth indicators in the eurozone have broadly disappointed investors’ optimistic expectations, hitting stocks. The problem wasn’t saber-rattling by President Trump, but rather the difficulty of rebalancing the Chinese economy after decades of breakneck expansion. It remains unclear whether growth can be propelled by expanding the base of wealthy Chinese consumers while maintaining political stability. After crises in 2008 and 2014, officials resorted to fiscal and credit stimulus to reignite investment. But the private-debt loads accumulated back then make them wary of repeating the trick now to the same extent. To be sure, fears of a financial meltdown are likely exaggerated: Because of its state-planned economy, Beijing can ultimately make many debt problems go away. And this weekend’s agreement will likely take some pressure off the Chinese currency, helping importers. But removing some of the urgency could also mean that Chinese officials take longer to ramp up fiscal stimulus. Without it, hopes of a new European boom look further away than ever. If US President Donald Trump's talks with Chinese President Xi Jinping at the G20 summit in Buenos Aires do not go well, he could make good on his threat to increase US tariffs on a wide range of Chinese goods. But the stakes are even higher than that. WASHINGTON, DC – At the G20 Summit in Argentina this weekend, US President Donald Trump will meet with Chinese President Xi Jinping to talk, above all, about trade. If their discussions do not go well, Trump could follow through on his threat to increase tariffs on a wide range of Chinese goods. But the stakes are even higher than that. 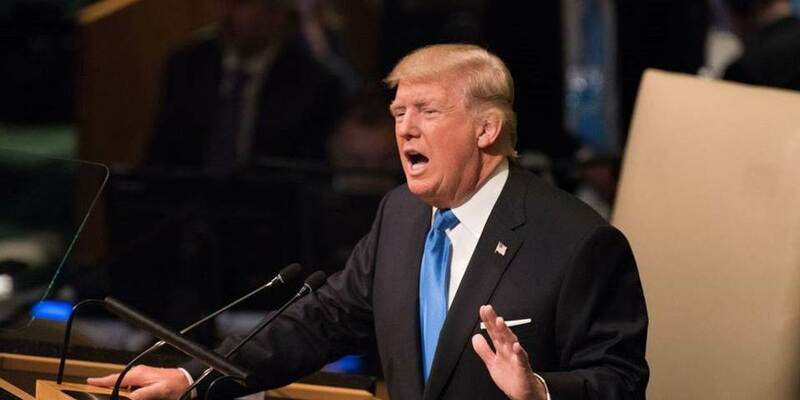 More broadly, Trump argues that the World Trade Organization has failed – for example, with regard to China – and that the United States should withdraw from the organization. Threatening to leave the WTO makes no sense even as a negotiating strategy, let alone as a policy, but it could still happen. The consequences for the US economy and for the world could be calamitous. Ostensibly, Trump’s current priority in discussions with the Chinese is stronger protection for US patents and copyrights. On the face of it, this makes some sense: it is estimated that various forms of “theft” of intellectual property cost the US economy at least $225 billion (1% of GDP). Protecting intellectual property has long been an important part of US trade policy, as reflected, for example, in the Uruguay Round of negotiations that concluded more than 20 years ago. And there have been conspicuous cases of industrial espionage that allegedly involve Chinese companies (or perhaps some branch of the Chinese government) stealing trade secrets from firms with operations in the US. But some of the most prominent American concerns about China’s intellectual-property regime today come from companies that want to invest in China, including the establishment of productive capacity there. China conditions these investments on technology transfer – a point highlighted by the US Trade Representative in a report released earlier this year, and now one of Trump’s talking points. China’s insistence on technology transfer increases the short-term cost of doing business (for US and other foreign direct investors) and creates the threat of future competition from Chinese firms. Trump vows to “bring back” manufacturing jobs to the US. How does making it easier for American companies to manufacture and innovate in China contribute to fulfilling that promise? Perhaps Trump’s agenda is the more conventional aspiration to “open markets” for US exports, and it is entirely possible that the Chinese will offer to buy more of some category of goods after the G20 summit. Trump likes headlines and most likely he would prefer a favorable news cycle or two, given the recent gyrations in financial markets. But such deals are typically meaningless – the goods were going to be bought anyway in some fashion. A more likely outcome, at the summit or soon after, will be another lurch in US policy against the existing WTO framework. The US is already blocking the appointment of judges to a key WTO appeals court. If this continues, the WTO adjudication process will effectively grind to a halt, perhaps as soon as next year. This would be a major loss: the WTO’s dispute settlement process is essential to rules-based global trade. And, contrary to what Trump claims, the US wins far more often than it loses at the WTO. From 1995 to March 2017, the US prevailed in 91% of cases that it brought against other countries, according to data from the conservative Cato Institute. But the US stands to lose a case brought against the Trump administration’s recently imposed tariffs on imported steel and aluminum, because they most likely violate WTO rules. So the White House now wants to undermine the WTO’s legitimacy and rescind US commitments to a multilateral trading system more broadly. Could the US actually pull out of the WTO? Chad Bown and Douglas Irwin of the Peterson Institute for International Economics have written a careful analysis of the possibilities (I am also affiliated with PIIE, but I was not involved with this work). In their view, the power to do so more likely lies with Congress. But Trump certainly could issue a declaration of withdrawal, and then litigate his authority to implement it. Which way would the Supreme Court decide? It is very hard to predict. And while that litigation continues, there would be great uncertainty about tariffs and much else. Bown and Irwin point out that, given how the system works, tariffs that are currently below 5%, on average, could jump to nearly 30%. There would naturally be retaliation in the form of higher tariffs imposed by America’s trading partners, which is exactly what happened after the steel and aluminum tariffs were imposed earlier this year. There are definitely valid concerns about how China conducts trade, including what Pascal Lamy, a former WTO director-general, calls “opaque, trade-distorting subsidization of high-tech products.” But, as Lamy says, a more effective way to deal with this would be to strengthen WTO rules. Plenty of other countries would like to join the US in such an effort. Unfortunately, as in so many areas, Trump prefers unproductive confrontation to cooperation. Simon Johnson, a former chief economist of the IMF, is a professor at MIT Sloan, a senior fellow at the Peterson Institute for International Economics, and co-founder of a leading economics blog, The Baseline Scenario. He is the co-author, with James Kwak, of White House Burning: The Founding Fathers, Our National Debt, and Why It Matters to You. What does it mean for the rest of life on Earth? Photo illustrations by Matt Dorfman. Source photographs: Bridgeman Images. Sune Boye Riis was on a bike ride with his youngest son, enjoying the sun slanting over the fields and woodlands near their home north of Copenhagen, when it suddenly occurred to him that something about the experience was amiss. Specifically, something was missing. It was summer. He was out in the country, moving fast. But strangely, he wasn’t eating any bugs. For a moment, Riis was transported to his childhood on the Danish island of Lolland, in the Baltic Sea. Back then, summer bike rides meant closing his mouth to cruise through thick clouds of insects, but inevitably he swallowed some anyway. When his parents took him driving, he remembered, the car’s windshield was frequently so smeared with insect carcasses that you almost couldn’t see through it. But all that seemed distant now. He couldn’t recall the last time he needed to wash bugs from his windshield; he even wondered, vaguely, whether car manufacturers had invented some fancy new coating to keep off insects. But this absence, he now realized with some alarm, seemed to be all around him. Where had all those insects gone? And when? And why hadn’t he noticed? Because insects are legion, inconspicuous and hard to meaningfully track, the fear that there might be far fewer than before was more felt than documented. People noticed it by canals or in backyards or under streetlights at night — familiar places that had become unfamiliarly empty. The feeling was so common that entomologists developed a shorthand for it, named for the way many people first began to notice that they weren’t seeing as many bugs. They called it the windshield phenomenon. When the investigators began planning the study in 2016, they weren’t sure if anyone would sign up. But by the time the nets were ready, a paper by an obscure German entomological society had brought the problem of insect decline into sharp focus. The German study found that, measured simply by weight, the overall abundance of flying insects in German nature reserves had decreased by 75 percent over just 27 years. If you looked at midsummer population peaks, the drop was 82 percent. Within days of announcing the insect-collection project, the Natural History Museum of Denmark was turning away eager volunteers by the dozens. It seemed there were people like Riis everywhere, people who had noticed a change but didn’t know what to make of it. How could something as fundamental as the bugs in the sky just disappear? And what would become of the world without them? Anyone who has returned to a childhood haunt to find that everything somehow got smaller knows that humans are not great at remembering the past accurately. This is especially true when it comes to changes to the natural world. It is impossible to maintain a fixed perspective, as Heraclitus observed 2,500 years ago: It is not the same river, but we are also not the same people. A 1995 study, by Peter H. Kahn and Batya Friedman, of the way some children in Houston experienced pollution summed up our blindness this way: “With each generation, the amount of environmental degradation increases, but each generation takes that amount as the norm.” In decades of photos of fishermen holding up their catch in the Florida Keys, the marine biologist Loren McClenachan found a perfect illustration of this phenomenon, which is often called “shifting baseline syndrome.” The fish got smaller and smaller, to the point where the prize catches were dwarfed by fish that in years past were piled up and ignored. But the smiles on the fishermen’s faces stayed the same size. The world never feels fallen, because we grow accustomed to the fall. By one measure, bugs are the wildlife we know best, the nondomesticated animals whose lives intersect most intimately with our own: spiders in the shower, ants at the picnic, ticks buried in the skin. We sometimes feel that we know them rather too well. In another sense, though, they are one of our planet’s greatest mysteries, a reminder of how little we know about what’s happening in the world around us. 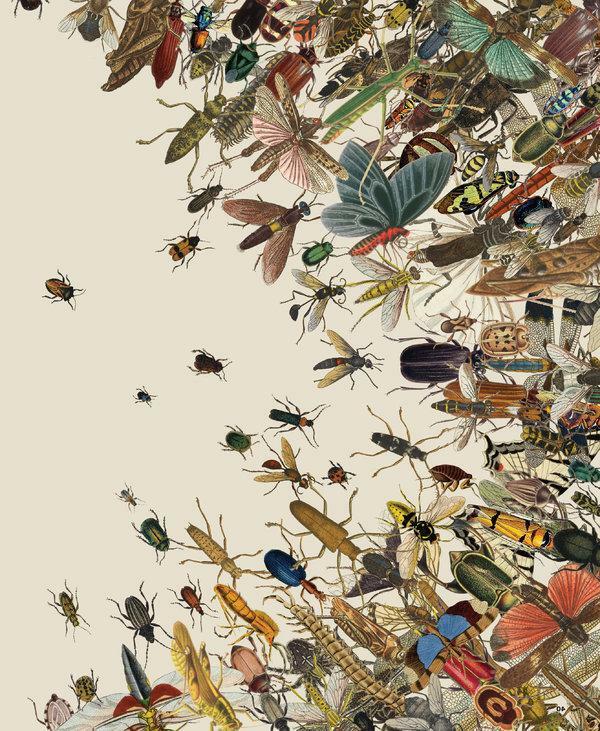 We’ve named and described a million species of insects, a stupefying array of thrips and firebrats and antlions and caddis flies and froghoppers and other enormous families of bugs that most of us can’t even name. (Technically, the word “bug” applies only to the order Hemiptera, also known as true bugs, species that have tubelike mouths for piercing and sucking — and there are as many as 80,000 named varieties of those.) The ones we think we do know well, we don’t: There are 12,000 types of ants, nearly 20,000 varieties of bees, almost 400,000 species of beetles, so many that the geneticist J.B.S. Haldane reportedly quipped that God must have an inordinate fondness for them. A bit of healthy soil a foot square and two inches deep might easily be home to 200 unique species of mites, each, presumably, with a subtly different job to do. And yet entomologists estimate that all this amazing, absurd and understudied variety represents perhaps only 20 percent of the actual diversity of insects on our planet — that there are millions and millions of species that are entirely unknown to science. With so much abundance, it very likely never occurred to most entomologists of the past that their multitudinous subjects might dwindle away. As they poured themselves into studies of the life cycles and taxonomies of the species that fascinated them, few thought to measure or record something as boring as their number. Besides, tracking quantity is slow, tedious and unglamorous work: setting and checking traps, waiting years or decades for your data to be meaningful, grappling with blunt baseline questions instead of more sophisticated ones. And who would pay for it? Most academic funding is short-term, but when what you’re interested in is invisible, generational change, says Dave Goulson, an entomologist at the University of Sussex, “a three-year monitoring program is no good to anybody.” This is especially true of insect populations, which are naturally variable, with wide, trend-obscuring fluctuations from one year to the next. If entomologists lacked data, what they did have were some very worrying clues. Along with the impression that they were seeing fewer bugs in their own jars and nets while out doing experiments — a windshield phenomenon specific to the sorts of people who have bug jars and nets — there were documented downward slides of well-studied bugs, including various kinds of bees, moths, butterflies and beetles. In Britain, as many as 30 to 60 percent of species were found to have diminishing ranges. Larger trends were harder to pin down, though a 2014 review in Science tried to quantify these declines by synthesizing the findings of existing studies and found that a majority of monitored species were declining, on average by 45 percent. Entomologists also knew that climate change and the overall degradation of global habitat are bad news for biodiversity in general, and that insects are dealing with the particular challenges posed by herbicides and pesticides, along with the effects of losing meadows, forests and even weedy patches to the relentless expansion of human spaces. There were studies of other, better-understood species that suggested that the insects associated with them might be declining, too. People who studied fish found that the fish had fewer mayflies to eat. Ornithologists kept finding that birds that rely on insects for food were in trouble: eight in 10 partridges gone from French farmlands; 50 and 80 percent drops, respectively, for nightingales and turtledoves. Half of all farmland birds in Europe disappeared in just three decades. At first, many scientists assumed the familiar culprit of habitat destruction was at work, but then they began to wonder if the birds might simply be starving. In Denmark, an ornithologist named Anders Tottrup was the one who came up with the idea of turning cars into insect trackers for the windshield-effect study after he noticed that rollers, little owls, Eurasian hobbies and bee-eaters — all birds that subsist on large insects such as beetles and dragonflies — had abruptly disappeared from the landscape. The signs were certainly alarming, but they were also just signs, not enough to justify grand pronouncements about the health of insects as a whole or about what might be driving a widespread, cross-species decline. “There are no quantitative data on insects, so this is just a hypothesis,” Hans de Kroon, an ecologist at Radboud University in the Netherlands, explained to me — not the sort of language that sends people to the barricades. even in protected areas where insects ought to be under less stress. The speed and scale of the drop were shocking even to entomologists who were already anxious about bees or fireflies or the cleanliness of car windshields. The results were surprising in another way too. The long-term details about insect abundance, the kind that no one really thought existed, hadn’t appeared in a particularly prestigious journal and didn’t come from university-affiliated scientists, but from a small society of insect enthusiasts based in the modest German city Krefeld. Krefeld sits a half-hour drive outside Düsseldorf, near the western bank of the Rhine. It’s a city of brick houses and bright flower gardens and a stadtwald — a municipal forest and park — where paddle boats float on a lake, umbrellas shade a beer garden and (I couldn’t help noticing) the afternoon light through the trees illuminates small swarms of dancing insects. Sorg, who rolls his own cigarettes and wears John Lennon glasses and whose gray hair grows long past his shoulders, is not a freewheeling type when it comes to his insect work. And his insect work is really all he wants to talk about. “We think details about nature and biodiversity declines are important, not details about life histories of entomologists,” Sorg explained after he and Werner Stenmans, a society member whose name appeared alongside Sorg’s on the 2017 paper, dismissed my questions about their day jobs. Leery of an article that focused on him as a person, Sorg also didn’t want to talk about what drew him to entomology as a child or even what it was about certain types of wasps that had made him want to devote so much of his life to studying them. “We normally give life histories when someone is dead,” he said. There was a reason for the wariness. Society members dislike seeing themselves described, over and over in news stories, as “amateurs.” It’s a framing that reflects, they believe, a too-narrow understanding of what it means to be an expert or even a scientist — what it means to be a student of the natural world. guides; others, driven by their own passion and following in a long tradition of “amateur” naturalism, are far from novices. Think of Victorians with their butterfly nets and curiosity cabinets; of Vladimir Nabokov, whose theories about the evolution of Polyommatus blue butterflies were ignored until proved correct by DNA testing more than 30 years after his death; of young Charles Darwin, cutting his classes at Cambridge to collect beetles at Wicken Fen and once putting a live beetle in his mouth because his hands were already full of other bugs. Those bottles of insects were gathered into thousands of boxes, which are now crammed into what were once offices in the upper reaches of the school. When the society members, like entomologists elsewhere, began to notice that they were seeing fewer insects, they had something against which to measure their worries. The current worldwide loss of biodiversity is popularly known as the sixth extinction: the sixth time in world history that a large number of species have disappeared in unusually rapid succession, caused this time not by asteroids or ice ages but by humans. When we think about losing biodiversity, we tend to think of the last northern white rhinos protected by armed guards, of polar bears on dwindling ice floes. Extinction is a visceral tragedy, universally understood: There is no coming back from it. The guilt of letting a unique species vanish is eternal. What we’re losing is not just the diversity part of biodiversity, but the bio part: life in sheer quantity. While I was writing this article, scientists learned that the world’s largest king penguin colony shrank by 88 percent in 35 years, that more than 97 percent of the bluefin tuna that once lived in the ocean are gone. The number of Sophie the Giraffe toys sold in France in a single year is nine times the number of all the giraffes that still live in Africa. Finding reassurance in the survival of a few symbolic standard-bearers ignores the value of abundance, of a natural world that thrives on richness and complexity and interaction. Tigers still exist, for example, but that doesn’t change the fact that 93 percent of the land where they used to live is now tigerless. This matters for more than romantic reasons: Large animals, especially top predators like tigers, connect ecosystems to one another and move energy and resources among them simply by walking and eating and defecating and dying. (In the deep ocean, sunken whale carcasses form the basis of entire ecosystems in nutrient-poor places.) One result of their loss is what’s known as trophic cascade, the unraveling of an ecosystem’s fabric as prey populations boom and crash and the various levels of the food web no longer keep each other in check. These places are emptier, impoverished in a thousand subtle ways. Scientists have begun to speak of functional extinction (as opposed to the more familiar kind, numerical extinction). Functionally extinct animals and plants are still present but no longer prevalent enough to affect how an ecosystem works. Some phrase this as the extinction not of a species but of all its former interactions with its environment — an extinction of seed dispersal and predation and pollination and all the other ecological functions an animal once had, which can be devastating even if some individuals still persist. The more interactions are lost, the more disordered the ecosystem becomes. A 2013 paper in Nature, which modeled both natural and computer-generated food webs, suggested that a loss of even 30 percent of a species’ abundance can be so destabilizing that other species start going fully, numerically extinct — in fact, 80 percent of the time it was a secondarily affected creature that was the first to disappear. A famous real-world example of this type of cascade concerns sea otters. When they were nearly wiped out in the northern Pacific, their prey, sea urchins, ballooned in number and decimated kelp forests, turning a rich environment into a barren one and also possibly contributing to numerical extinctions, notably of the Steller’s sea cow. It is estimated that, since 1970, Earth’s various populations of wild land animals have lost, on average, 60 percent of their members. Zeroing in on the category we most relate to, mammals, scientists believe that for every six wild creatures that once ate and burrowed and raised young, only one remains. What we have instead is ourselves. A study published this year in the Proceedings of the National Academy of Sciences found that if you look at the world’s mammals by weight, 96 percent of that biomass is humans and livestock; just 4 percent is wild animals. We’ve begun to talk about living in the Anthropocene, a world shaped by humans. But E.O. Wilson, the naturalist and prophet of environmental degradation, has suggested another name: the Eremocine, the age of loneliness. Wilson began his career as a taxonomic entomologist, studying ants. Insects — about as far as you can get from charismatic megafauna — are not what we’re usually imagining when we talk about biodiversity. Yet they are, in Wilson’s words, “the little things that run the natural world.” He means it literally. Insects are a case study in the invisible importance of the common. Scientists have tried to calculate the benefits that insects provide simply by going about their business in large numbers. Trillions of bugs flitting from flower to flower pollinate some three-quarters of our food crops, a service worth as much as $500 billion every year. (This doesn’t count the 80 percent of wild flowering plants, the foundation blocks of life everywhere, that rely on insects for pollination.) If monetary calculations like that sound strange, consider the Maoxian Valley in China, where shortages of insect pollinators have led farmers to hire human workers, at a cost of up to $19 per worker per day, to replace bees. Each person covers five to 10 trees a day, pollinating apple blossoms by hand. By eating and being eaten, insects turn plants into protein and power the growth of all the uncountable species — including freshwater fish and a majority of birds — that rely on them for food, not to mention all the creatures that eat those creatures. We worry about saving the grizzly bear, says the insect ecologist Scott Hoffman Black, but where is the grizzly without the bee that pollinates the berries it eats or the flies that sustain baby salmon? Where, for that matter, are we? Bugs are vital to the decomposition that keeps nutrients cycling, soil healthy, plants growing and ecosystems running. This role is mostly invisible, until suddenly it’s not. After introducing cattle to Australia at the turn of the 19th century, settlers soon found themselves overwhelmed by the problem of their feces: For some reason, cow pies there were taking months or even years to decompose. Cows refused to eat near the stink, requiring more and more land for grazing, and so many flies bred in the piles that the country became famous for the funny hats that stockmen wore to keep them at bay. It wasn’t until 1951 that a visiting entomologist realized what was wrong: The local insects, evolved to eat the more fibrous waste of marsupials, couldn’t handle cow excrement. For the next 25 years, the importation, quarantine and release of dozens of species of dung beetles became a national priority. And that was just one unfilled niche. (In the United States, dung beetles save ranchers an estimated $380 million a year.) We simply don’t know everything that insects do. Only about 2 percent of invertebrate species have been studied enough for us to estimate whether they are in danger of extinction, never mind what dangers that extinction might pose. The strange thing, Lister said, is that, as staggering as they are, all the declines he documented would still be basically invisible to the average person walking through the Luquillo rain forest. On his last visit, the forest still felt “timeless” and “phantasmagorical,” with “cascading waterfalls and carpets of flowers.” You would have to be an expert to notice what was missing. But he expects the losses to push the forest toward a tipping point, after which “there is a sudden and dramatic loss of the rain-forest system,” and the changes will become obvious to anyone. The place he loves will become unrecognizable. The insects in the forest that Lister studied haven’t been contending with pesticides or habitat loss, the two problems to which the Krefeld paper pointed. Instead, Lister chalks up their decline to climate change, which has already increased temperatures in Luquillo by two degrees Celsius since Lister first sampled there. Previous research suggested that tropical bugs will be unusually sensitive to temperature changes; in November, scientists who subjected laboratory beetles to a heat wave reported that the increased temperatures made them significantly less fertile. Other scientists wonder if it might be climate-induced drought or possibly invasive rats or simply “death by a thousand cuts” — a confluence of many kinds of changes to the places where insects once thrived. Like other species, insects are responding to what Chris Thomas, an insect ecologist at the University of York, has called “the transformation of the world”: not just a changing climate but also the widespread conversion, via urbanization, agricultural intensification and so on, of natural spaces into human ones, with fewer and fewer resources “left over” for nonhuman creatures to live on. What resources remain are often contaminated. Hans de Kroon characterizes the life of many modern insects as trying to survive from one dwindling oasis to the next but with “a desert in between, and at worst it’s a poisonous desert.” Of particular concern are neonicotinoids, neurotoxins that were thought to affect only treated crops but turned out to accumulate in the landscape and to be consumed by all kinds of nontargeted bugs. People talk about the “loss” of bees to colony collapse disorder, and that appears to be the right word: Affected hives aren’t full of dead bees, but simply mysteriously empty. 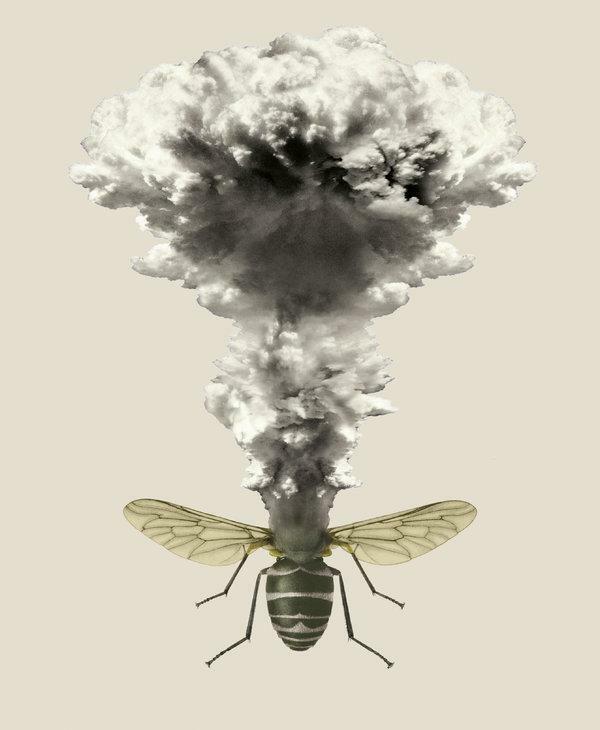 A leading theory is that exposure to neurotoxins leaves bees unable to find their way home. Even hives exposed to low levels of neonicotinoids have been shown to collect less pollen and produce fewer eggs and far fewer queens. Some recent studies found bees doing better in cities than in the supposed countryside. Since the Krefeld study came out, researchers have begun searching for other forgotten repositories of information that might offer windows into the past. Some of the Radboud researchers have analyzed long-term data, belonging to Dutch entomological societies, about beetles and moths in certain reserves; they found significant drops (72 percent, 54 percent) that mirrored the Krefeld ones. Roel van Klink, a researcher at the German Center for Integrative Biodiversity Research, told me that before Krefeld, he, like most entomologists, had never been interested in biomass. Now he is looking for historical data sets — many of which began as studies of agricultural pests, like a decades-long study of grasshoppers in Kansas — that could help create a more thorough picture of what’s happening to creatures that are at once abundant and imperiled. So far he has found forgotten data from 140 old data sets for 1,500 locations that could be resampled. Thomas believes that this naturalist tradition is also why Europe is acting much faster than other places — for example, the United States — to address the decline of insects: Interest leads to tracking, which leads to awareness, which leads to concern, which leads to action. Since the Krefeld data emerged, there have been hearings about protecting insect biodiversity in the German Bundestag and the European Parliament. European Union member states voted to extend a ban on neonicotinoid pesticides and have begun to put money toward further studies of how abundance is changing, what is causing those changes and what can be done. When I knocked on the door of de Kroon’s office, at Radboud University in the Dutch city Nijmegen, he was looking at some photos from another meeting he had that day: Willem-Alexander, the king of the Netherlands, had taken a tour of the city’s efforts to make its riverside a friendlier habitat for bugs. Scientists hope that insects will have a chance to embody that resilience. While tigers tend to give birth to three or four cubs at a time, a ghost moth in Australia was once recorded laying 29,100 eggs, and she still had 15,000 in her ovaries. The fecund abundance that is insects’ singular trait should enable them to recover, but only if they are given the space and the opportunity to do so. “It’s a debate we need to have urgently,” Goulson says. “If we lose insects, life on earth will. ...” He trailed off, pausing for what felt like a long time. In Denmark, Sune Boye Riis’s transect with his car net took him past a bit of woods, some suburban lawns, some hedges, a Christmas-tree farm. The closest thing to a meadow that we passed was a large military property, on which the grass had been allowed to grow tall and golden. Riis had received instructions not to drive too fast, so traffic backed up behind us, and some people began to honk. “Well,” Riis said, “so much for science.” After three miles, he turned around and drove back toward the start. His windshield stayed mockingly clean. At the end of the transect, Riis stopped at another parlous roadside spot, unfastened the net and removed the small bag at its tip. Some volunteers, captivated by what the study revealed about the world around them, asked the organizers for extra specimen bags, so they could do more sampling on their own. Some even asked if they could buy the entire car-net apparatus. Riis, though, was content to peer through the mesh, inside of which he could make out a number of black specks of varying tininess. There was also a single butterfly, white-winged and delicate. Riis thought of the bet with his friends, for which the meaning of bigness had not been defined. He wondered how it might be reckoned. What gave a creature value?